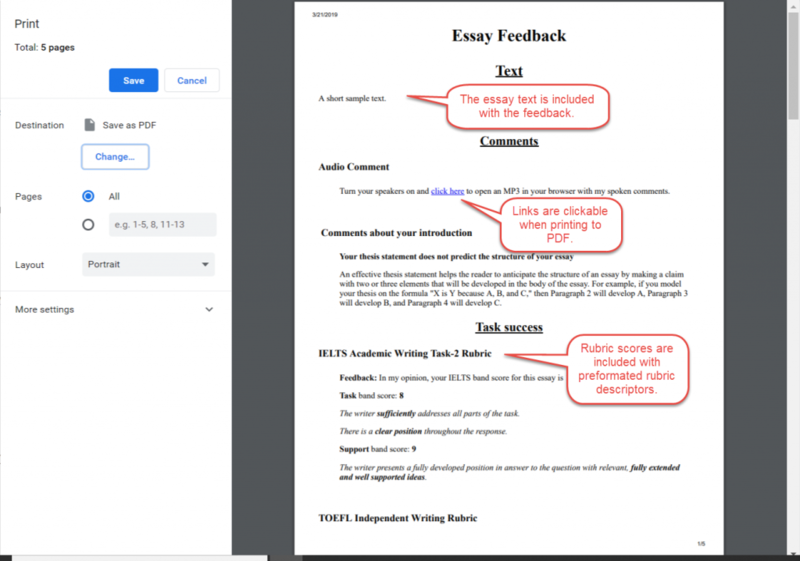 Imagine a website that could help students write better essays with automated feedback. 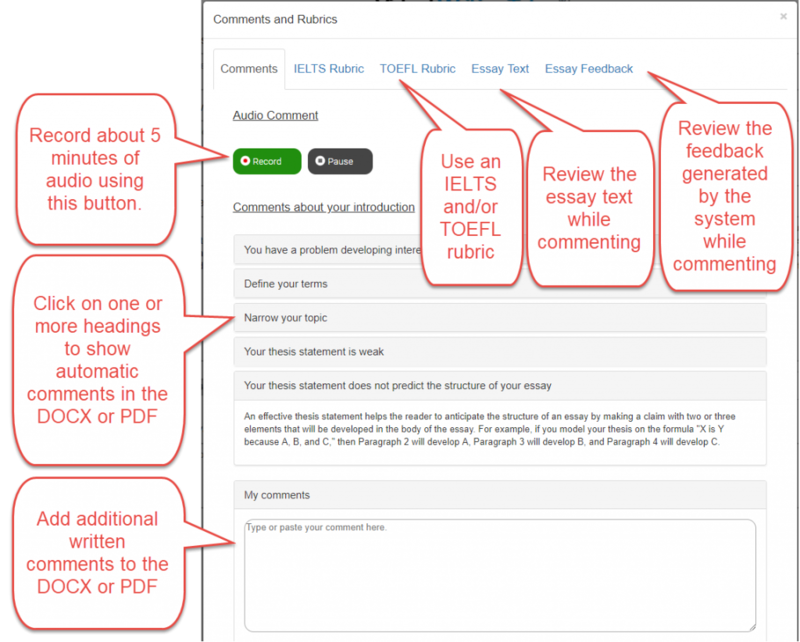 Now imagine the same website but with additional commenting tools to help people record audio comments and rate each other’s essays using IELTS and TOEFL rubrics and comments. 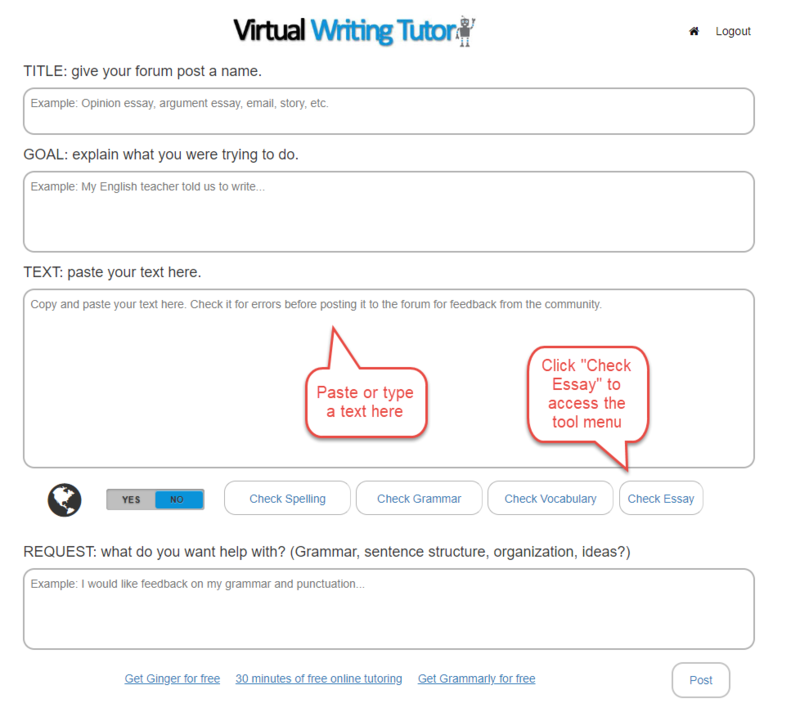 There you have it: an essay checker for the Virtual Writing Tutor. That’s what I have been imagining for the past few months, and Raju, my developer, has been building it. Although, in the past, I have strongly recommended using pen pal or narrative writing tasks with beginners and low intermediates before assigning academic essay writing tasks, I am ready to admit that I am happy with our progress. It should help to make peer feedback on this notorious form of display writing easier and more reliable. If you write or teach essays, I think you will like what we have come up with, too. 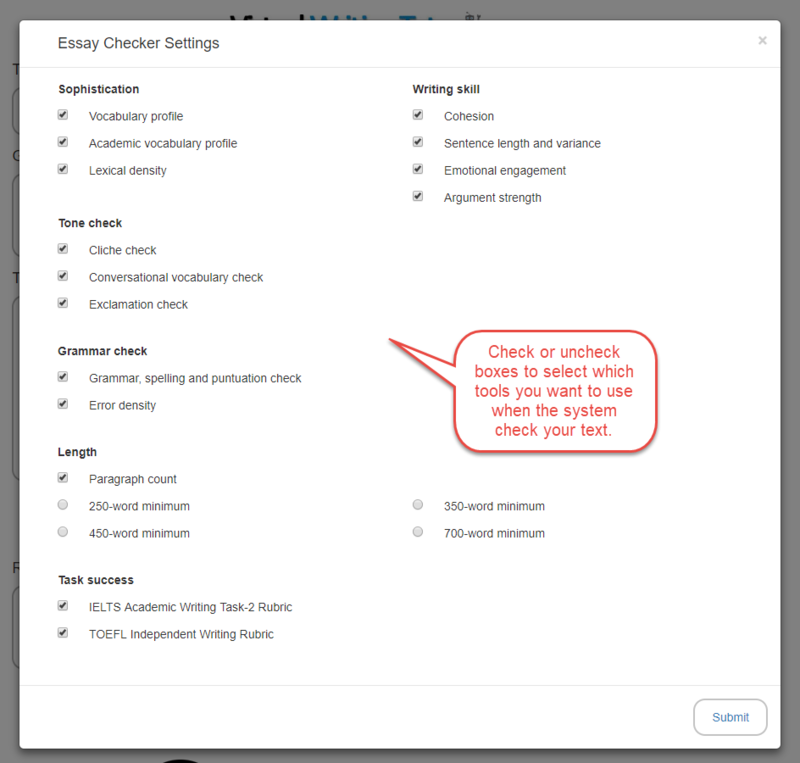 There is a lot to it, so I will take you through the main features of the new essay checker, step-by-step, before explaining the individual tools. Right now, it is only available on the Virtual Writing Tutor Forum, but we will integrate it into the main page of the Virtual Writing Tutor soon. Access the essay checker from the forum. You need to be a member to use the forum, but membership is free and we don’t send spam. Once you have logged in, click on “Add new topic.” You’ll be taken to this next page. Notice the “Check Essay” button. 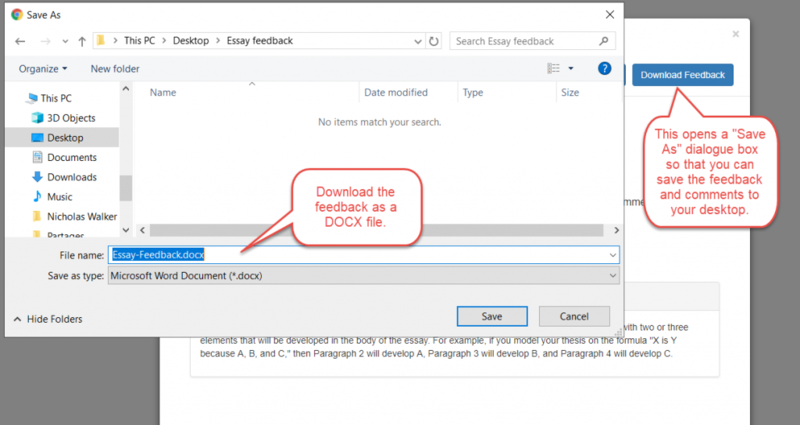 Once you have pasted a text into the text are, click it and you will see a pop-up with a menu of essay checker tools. Leave the default choices selected so that you can see what the system can do. 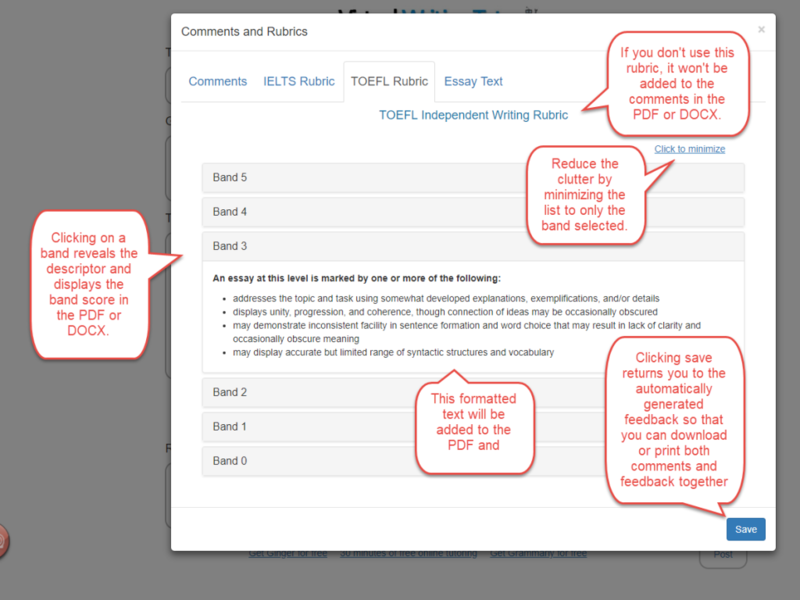 Next, click “Submit.” The text you enter on the forum will be sent to the essay checker for analysis. 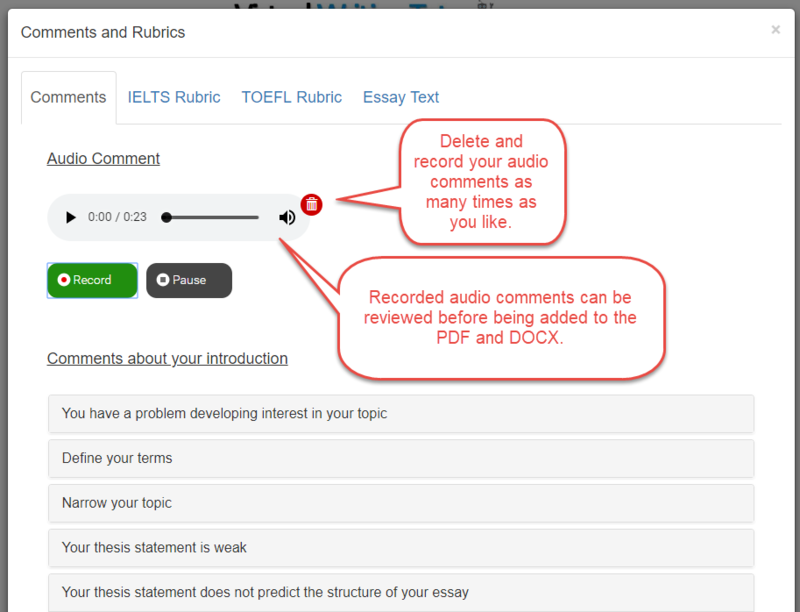 Review the essay checker results before clicking the “Comments and Rubrics” button. 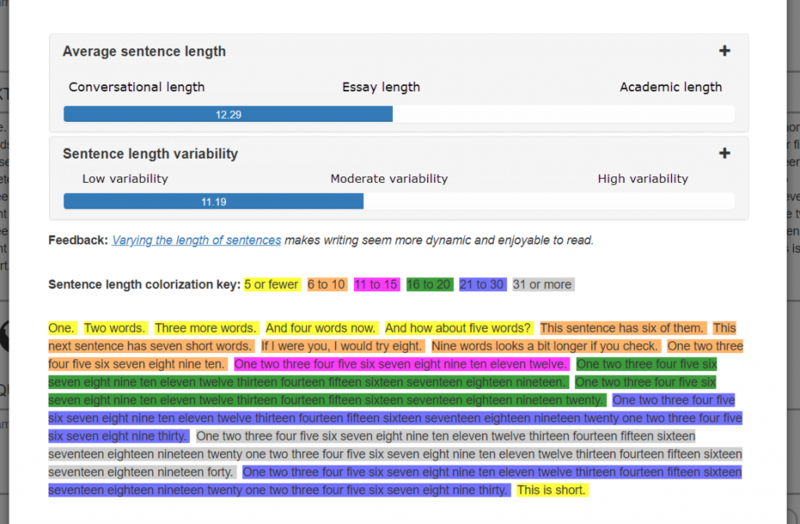 The feedback popup colorizes sentences based on their length. In the screenshot below, you can see an example of a paragraph made up of sentences of different lengths. The graphs at the top show the length and variability. Below them are the colorized sentences. You can record your spoken comments to MP3 format using this online voice recorder. It is great for simply reading the essay aloud to show the author where you stumble, and it makes recording and uploading voice of the reader comments easy. You can speak for about 5 minutes. 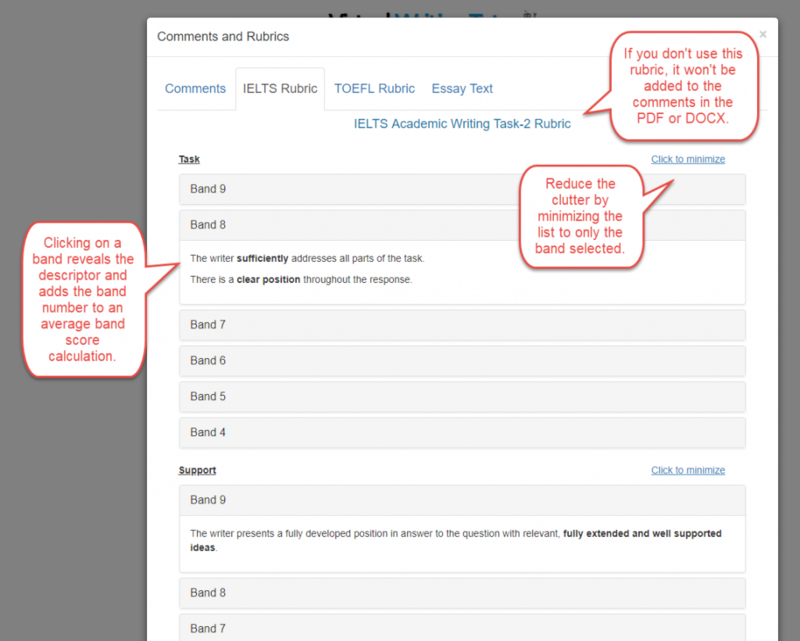 You can even switch tabs and talk about why you selected the descriptors you chose for the IELTS and TOEFL rubrics. When you click “Save,” your browser converts your recording to MP3 format, and the system uploads the MP3 file to the Virtual Writing Tutor server for you. The system then stores the URL of the recording in memory and inserts a link into your Word document or PDF. You can review and delete recordings and start again if you like. You can choose from 9 descriptors for each aspect of the essay. To reduce the space on the screen, you can minimize each rubric section to show only the descriptor you chose. After you have chosen descriptors, the system calculates a score for you. You can choose from 5 descriptors to evaluate the essay. To reduce the space on the screen, you can minimize the choices to show only the descriptor you chose. The system will display the associated score in the DOCX of PDF file. Your browser allows you to print your feedback to a number of devices, including PDF. The great thing about PDFs is that you can store them on your computer, edit them with MS Word, and send them as attachments to students. Chrome will generate a preview of the PDF for you. Notice that the feedback is plain text, for readability. 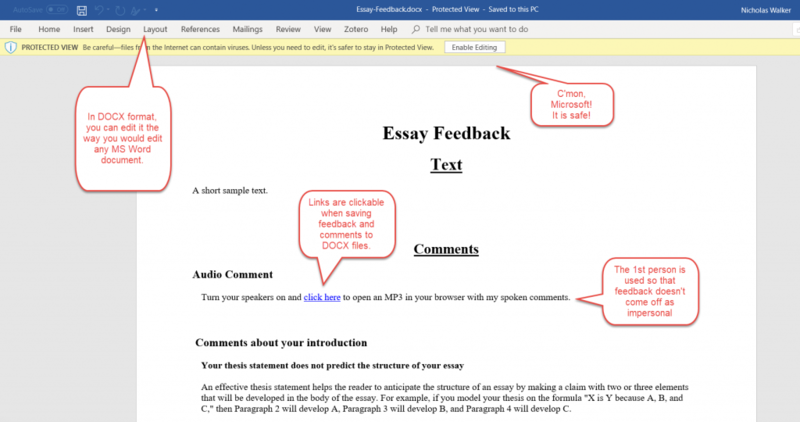 You can download all of the automatically generated feedback and your comments to an MS Word document. This makes editing the feedback very easy. 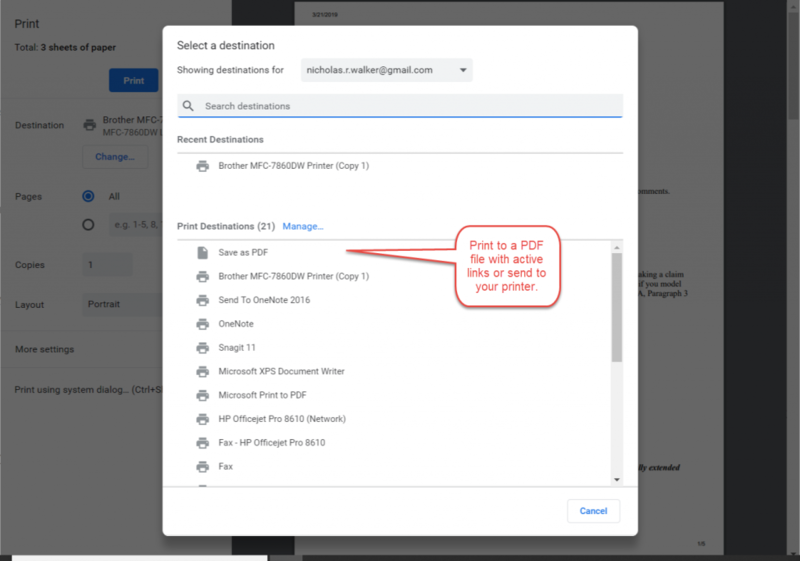 It is much quicker than converting a PDF to DOCX format. We hope users find it useful. Be sure to enable editing. The download is safe, despite the warning. This is just Microsoft’s way of scaring everybody and calling it security. 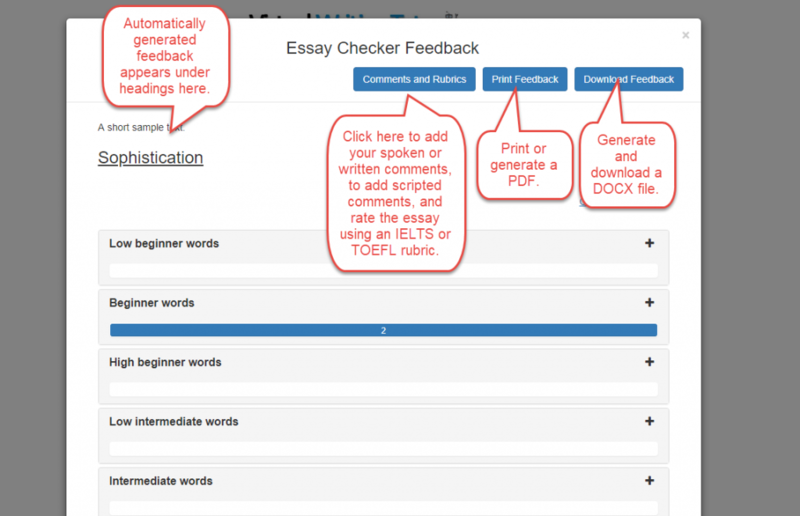 I trust this gives you a clear overview of what the Essay Checker can do. We will be adding it to the main page of the Virtual Writing Tutor soon. We would do it sooner, but we want to upgrade the main page first. We expect the system to be much faster once the upgrades are done.